We have been working on a pervasive environment where entities (devices or services) proactively collaborate each other to fulfill user intentions in a seamless manner. For that purpose, we aim to design a novel platform called Urban Space Robot which is an autonomic computing platform for IoT-enabled smart city. A person’s needs in a certain space change all the time according to his/her past experience such as social interactions. In addition, not only do people move around a great number of places in their daily lives, but even the environment in a single place can change greatly in a short amount of time. To predict a user’s needs (or intentions) in the given context, Urban space robot proactively builds a knowledge base on urban citizens’ intentions using a cyber-physical convergence data. Then, to support a recognized user’s need appropriately, Urban space robot helps distributed IoT agents collaborate together. When user requirements or urban setup changes, Urban space robot reconfigures the collaborative IoT service to maximize Quality-of-Service (QoS) dynamically. 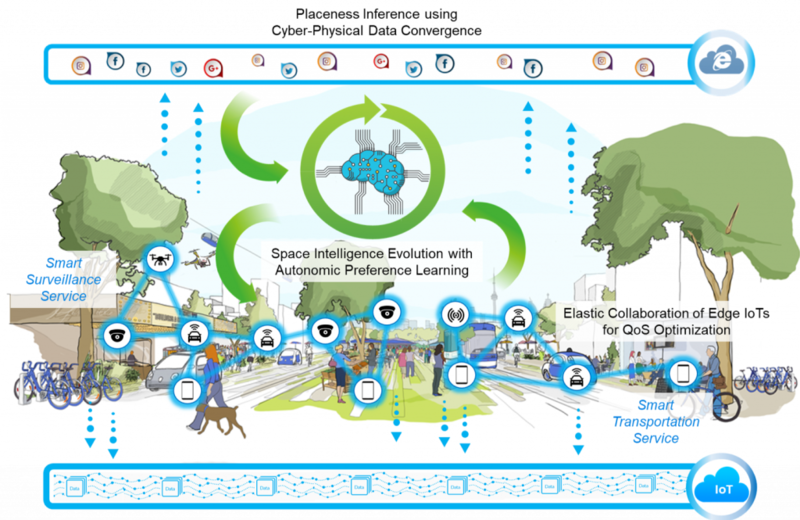 From the user-IoT interactions, IoT agents learn user preferences and the urban intelligence evolves autonomously. Edge computing is a promising technology which enables users to exploit mobile devices or Internet-of-Things (IoT) devices in close proximity for low latency. Its performance is often affected by a subtle change in environment contexts, which existing solutions do not handle efficiently since IoT devices are treated just as sensors or actuators. Therefore the edge cloud receive the whole raw data stream from edge IoT and then figure out what actions should be taken in the presence of environment context changes (e.g., the location of a user under surveillance or the traffic congestion level). However, a subtle change in environment contexts such as brightness in an edge IoT camera can lead to immediate service quality degradation due to the inability to detect such a change in a timely manner, which may result in critical failures in certain applications. Thus, we aim to build an edge IoT system with allows edge devices dynamically reconfigure and collaborate accordingly to the context changes.